I'm looking for socks for the following conditions and to complement the following footwear. My wife frequently spends several hours driving a car (setting car temperature to stay around +20°C) , then switches for 30 min to 2 hours for moderate outdoor walking in weather like -5..-10°C (eg waiting for a child which rides alpine ski). Her current socks (cotton) get wet while in the car because of sweating, so her feet quickly starts freezing once she gets outdoors. It looks like she needs a socks with (a) strong moisture-eliminating properties (think Coolmax or similar fibers?) that will be also (b) comfortable in car conditions and (c) warm enough in outdoor conditions. Is such approach correct? Given her current shoes, what are optimal socks to keep feets warm during a day? What % composition of each fiber is most suitable for the problem in hand? They are 74% merino wool, 20% nylon, and 6% Lycra Spandex. They breath very well, and keep you feet warm even when they are wet. I wear them in my hiking boots in the heat of the summer, and all the way down to -30°C. I have them on my feet right now actually. I've been walking to work in them on the coldest snowiest days of winter (normally I ride my bike, but still wear the same socks). Of course I have nice boots too, you can't expect a sock to compensate for poor footwear, they're meant to compliment them. When it gets really cold, and I'm going to be standing around for a while, then I'll layer these socks inside of a pair of big thick wool socks in thinner boots. But I've never had cold feet wearing these socks in my Sorel Glacier boots (rated to -74°C). I always wear different socks when hiking compared to when doing anything else, like driving. I don't like hiking with thin socks and shoes and I don't like driving with thick socks and boots. It only takes a couple of minutes to change. Wicking is not the most important factor here. You need a material that wicks and also has good insulation when moist / wet. With boots her feet are going to sweat in the car. 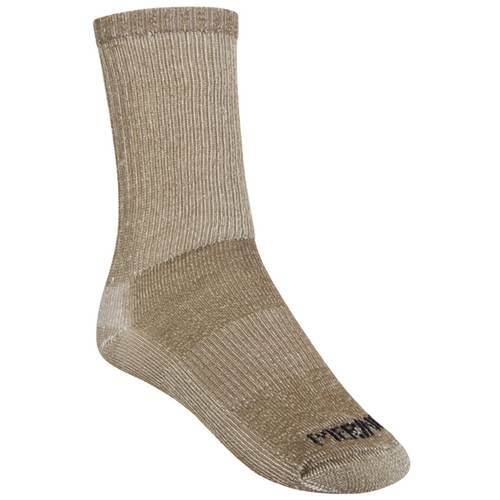 Cotton: 100% cotton is not recommended as a sock material for hiking. Cotton absorbs sweat, dries slowly, provides no insulation when wet and it can lead to blisters out on the trail. However, cotton is quite comfortable and, when combined with wool or other wicking and insulating fibers, can be a good choice for light hiking in summer. Wool: Wool is the most popular natural sock material. It is warm, cushioning and retains warmth when wet. While older ragg wools could be scratchy next to your skin, newer merino wools are itch-free. Most wool socks use blends of wool and synthetic materials for better durability and faster drying. Synthetic insulating materials: Some man-made materials are designed to insulate like wool and wick moisture. These materials (Hollofil®, Thermax®, Thermastat®) trap warmth like wool, but dry more quickly and are more abrasion resistant. As for thick or thin you need to go for what fits with the existing boots. Thick is warmer. In the car use vent or both rather than pure heat directed at the floor. Wear a light jacket so she can comfortably drive the car at a lower temperature. The problem seems to be not in the socks. She should prevent her legs\socks from getting wet. I suggest to take off the shoes while driving. Especially shoes with Thinsulate. If her legs\socks are wet then it will be cold in any socks. I second the SmartWool - I have one pair of those. My favorite winter riding socks are made by Wigwam - they used to be called Ingenious - they wisk the moisture away from your feet, and keep you warm and dry! Not the answer you're looking for? Browse other questions tagged winter socks or ask your own question. When are cotton socks actually better? How do I disinfect my wool hiking socks?